I want to share with you the Charlie-Foxtrot that was awaiting me at 4:55 last Friday evening. Other than that, I had a wonderful Christmas weekend. How was yours? On Sunday we celebrated the holiday with my side of the family at my brother’s house. We had our traditional fondue supper, and followed it up with unwrapping of the presents, the traditional tore-up wrapping-paper wad throwing, and yummy chocolate fondue for dessert. On Monday we were invited to Junior’s girlfriend’s parent’s house (who, probably in a couple of years, will be referred to as the In-Laws. You know, I’ve often wondered why the family of your spouse, or of your children’s spouses are called In-Laws. It almost sounds like a profession: “Are you in real estate?” “No, actually I’m in-law”…anyway…) for a pig roast. Cuban-style. And her entire family was there. ENTIRE! I was a little nervous at first. But about 5 minutes after we got there I felt right at home. Her family is just as boisterous, fun-loving, animated, down to earth and slightly off-kilter as my own family. Even MY in-laws had a great time, which is really saying something. Notes: This scarf turned our beautifully, and even though I bitched about having to constantly schlep beads down the strand of yarn (I think I may have even used the “F” word…fiddly), it knit up very quickly. I enjoyed watching how the beads stacked up, and how the colors shifted from row to row. The only thing I’m kicking myself over is the fact that I actually BOUGHT the pattern. It’s so simple that I could have probably figured it out for myself and saved myself the $6, maybe. Oh well, live and learn! I now have an accurate bead count so I can make another and not spend a small fortune on beads, which I can get at the garment district of downtown Los Angeles for a fraction of the cost I paid at SAFF. 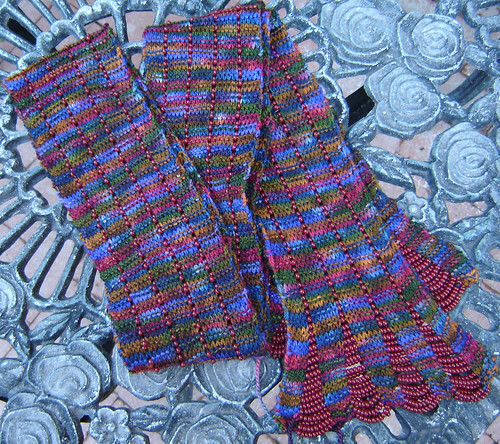 This scarf was my only Christmas knitting this year, part of a gift for Junior’s girlfriend, who just ADORES scarves. I did, however, warn Junior not to stand too close behind her as she’s thowing it over her shoulder, else he find himself knocked out on the ground. See, it’s 2 gifts in 1: A self-defense weapon camoflaged as a high fashion knitted scarf! If that doesn’t say “Welcome to the Family” I don’t know what does!